The December Giveaway is a little late - just getting it in! The run-up to Christmas was pretty busy, trying to organise everything. It was a good Christmas though. C proposed on Christmas Eve which was quite unexpected, I sang rather well at mass on Christmas Eve, and Christmas Day we went down to Wexford and had a lovely day with my family. Any how, leave a message by Janaury 1st and I will pick three winners that morning to win a pdf knitting pattern for Bobble, Squeek and Pierre. This morning I got a message that my Fairy Godmother knitting pattern is featured in one of the Treasuries on Etsy. So exciting as it's my first on. Woo Hoo! It was put together by Artwolf. My Christmas Present for Me! Well, our carol service didn't go too bad. I started off a bit shaky as I was very nervous but I think I got better as I went on. The highlight of the show was the Fillipino choir. They were actually a children's choir and ranged from very young to early teens. They were very cute, had actions and very confident. I was so jealous! This is my present to myself for Christmas. I found the pattern for free through Ravelry. Its available through the Little Turtle Knits website. It was super fast to knit and looks so nice on. Its inspired by the hat Kirsten Dunst wore in ElizabethTown. Blogging has fallen by the wayside this week as I have been so busy. I had two christmas parties - one on Tuesday night with the knitting group, and one on Thursday with the church folk choir. On Thursday myself and Smem had to go to the dump and we also went shopping and to her grandparents in Dublin. On Friday we had to go into the city centre, and yesterday we all went out for a family lunch. I haven't been so busy outside the house in ages. And it doesn't stop today. My parents and sister are visiting, then I have a carol service to sing at at 5pm and mass to sing at a 7pm. Lord, my days are full. I have managed to do a bit of crafting though. On Wednesday I realised that Smem had no stocking. I had bought dpns last time I was in Wexford so I decided to give a sock a go. It's not perfect by any stretch of the imagination! I only found one pattern that I half liked but it was far too long so I had to doctor it to make it the right size. I finally got around to knitting the christmas stockings fromLittle Cotton Rabbit. They are so cute and so quick to make. It's taking me less than 2 hours to make one, even with the fairisle design. We are going to a family dinner the day after Stephen's Day so these little socks will be presents for the kids. I just have another two to make. I also got my god-daughter's present finished - finally! I think it turned out really cute in the end. I hope she likes it. And more importantly - I hope it fits! This is a new pattern I've been working on this week - Blanket Bear. It started off being something else but I think he turned out quite nice. He's ever so cute. He's just 19cm/7inch tall and can sit up himself - thanks to his little tail. The pattern will be for sale in my Etsy shop. I have pretty much spent most of this week making and writing christmas cards. I was inspired by a card in Crafts Beautiful (a crafting magazine) of a chopped up christmas tree. Theirs was much more colour co-ordinated than mine but I like them. I had various green, red, purple, blue, black and white papers and just jumbled them all up. I had plenty of plain green and red cards left over from a few years ago so I just used them. All in all, I think I made around 50 cards. Writing the damn things takes the most time though. Plus time to go to the post office and get stamps and then more time to go actually post them. And the weather has been freezing this week so that hasn't been pleasant. In Smem news, she has a cold this week. Her nickname is now Snotser. The poor chicken! She does seem to be getting a little better now though so hopefully she is over the worst of it. Firstly I cut the fat quarter into 2.5inch strips. These I wrapped tightly around a polystyrene ring, taking care to catch the end of one while starting the next. When I got to the end I secured the last one with a pin. Then I wrapped the skinny ribbon over the fabric and secured the end over the start with a pin. Out of the fat ribbon I made a bow and pinned it to the front of the wreath. Viola! A pretty christmas wreath that only takes about 20 mins to make. Between yesterday and today I have got some lovely post. The final three ornaments from the EtsyFAM swap arrived and they're all rather pretty. I put up my (fake) christmas tree this morning so they are all residing happily there. So finally here is the no-sew garland. Myself and Smem have been out and about every day this weekend so I've barely got to the computer. First I made templates of 2 triangles, one bigger than the other. The large triangle is 6 inches wide at the top and 8.5 inches long. Next cut out 17 large triangles from the red felt and 17 green triangles from the green felt. To make the lettering, draw the mirror images of the letters 'merry christmas' on to the back of the white felt. I have an alphabet stencil so I just copied the letters backwards. Next stick the green triangles to the red using the glue. When they are dry, stick the lettering on. There will be 3 triangles with no lettering, as they go before, after and between the words. Sew all the triangles together, in the right order! To do this I ran them all through my sewing machine one after the other. I discovered this blog - Tuesday To Do - while on blogland travels during the week. There are some really cool tutorials to make christmas-y stuff. I am definitely going to try the bird ornament. 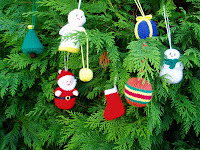 Coming up will be instructions for how to make an almost no-sew christmas garland. I have all the pieces made and just have to put them together, which will hopefully happen tomorrow morning. 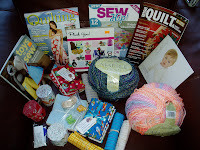 In crafting news, I have been working away on bib designs for issue 3 of Irish Quilting, my own garland design, a cardigan for my god-daughter for christmas and a mock-up for the birthday atc swap that was organised by Kate (see her blog in the list of blogs on the right). Seen as the holiday spirit is on me, I thought I would share my latest pattern - the lovely Bow Bag. I made this one using chunky wool and 4.5mm needles so the knitting is really tight. Gauge doesn't really matter, just have nice tight knitting. 4.5mm circular needles, 80cm long. Knit straight as though knitting on straight needles, i.e. do not join in the round. Join the knitting into the round. Continue to knit g-st in the round (so that it looks like st-st) until the piece measures 20cm/8in. Next Row: (K1, K2tog) to end - 88 sts. From this point stop knitting in the round. To make up, join the rows ends of g-st at the top and bottom of the bag. Oversew across cast on sts. Mark where you want the handles to be positioned. I know I was going to post a free pattern for a bag this morning but I came across this blog while reading my usuals and I just had to pass it on. Little Cotton Rabbit Check it out for the most beautiful knitted toys. And there are free patterns too which are absolutely adorable. My favourite are some mini stockings for the christmas tree with lovely fairisle designs - and they're knitted on straight needles. My hero! Shelly - I have sent you the pattern via email. 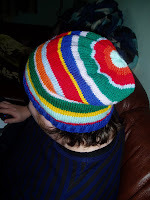 Debhi - I've convo'd you on Ravelry. Send on your email and I'll send on the pattern. Teddy's Mom - Please send me on your email so I can send the pattern to you. Stay tuned 'cause tomorrow I will post a free pattern for a bag. He's about 7.5 inches tall, including his ears, and sports a jaunty scarf. Leave a comment by Sunday night and three will be picked at random on Monday morning. 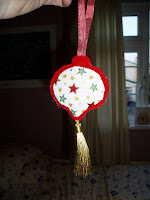 The first ornament from the EtsyFam (Fabulous Artistic Mams) swap arrived in the post today. It's really cute. It doesn't show so well in the photo but the blue bit is sparkly. I can't wait to get the tree up. It was made by Melanie. Her shop is Whimsical Creations. Check it out! I was getting tired of the pink so the blog has changed to nice fresh green. When we moved in to our house here in Celbridge we discovered that although the shower worked, the pressure in it was ridiculously light. There just wasn't a hope of washing yourself. It kinda felt like someone was drooling on you. Awful! So the bathroom was added to the long list of jobs to be done. Given that it involved tiling, among other things, C put this job off and off. But last weekend he finally got finished and just had to give the plumber a call to come and install the new shiny shower. He rang Roy on Monday and was in the house within two hours - he is a keeper, for sure. So now we have a fully working shower. I tried it out this morning. It is so long since my hair has been this clean. Rinsing it using a jug while you're in the bath is not the best - so old-school! This is Mr. Squirrel so far. He needs some clothes - a scarf or something. The tail took a few goes to work out but is quite good in the end. He will definitly be finished by the middle of the week so November's giveaway will be next weekend, for anyone who would like a chance to get a free pattern. In quilting news, I've finally got to start quilting my quilt. Its taking longer than I thought. It took about 3 hours just to baste it all together. And now I've figured out that I need to pin each square before I quilt it. So its slow. But I managed to get a bit done today. At least now that I've started it half the battle is won. She's posted a little art video from Utube. Check it out 'cause its super cute! Smem and myself went down to Wexford for my god-daughter's birthday (the one in the red). Smem enjoyed being around lots of other kids. And it was fancy-dress so she got to showcase her fairy princess costume again. We got back on Tuesday so I could go to knitting. Priorities! Yesterday we all took a family day to the zoo - me, Smem and C. Smem couldn't see over most of the fences and didn't bother to look at most of the animals that we pointed out. Me and C enjoyed it though. Here is one of the baby elephants. In serious trouble at the moment trying to get my quilt done. Smem is taking up so much of my time. Still, I have until the end of next week so it should be okay. I'm also trying to get another knitting pattern out for this month for another giveaway this month. It will be a squirrel, possibly wearing a hat, so stay tuned to be in with a chance to win. Since I last posted I have done major work on my quilt. All the embroidery and applique are done. Now I just have to sew on the border and quilt and bind it all. No problem! But it will have to wait a few days. It was my beautiful god-daughters 'happy birthday' this week and there is to be a fantastic party tomorrow down in Wexford. 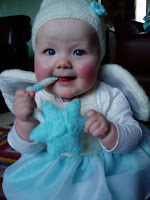 Its fancy dress to Smem will get to wear her fairy princess outfit again. Yeah! I had knit Jemima-Jane over the summer in anticipation. However her hair wasn't quite right and I hadn't done her hat so I spent yesterday evening and today at that. I think she looks quite pretty now. Yesterday was busy as we had another panel meeting for Irish Quilting. Turns out my quilt is to go in issue 2 , not issue 3, so I need to have it finished by the end of November. I might not be making so many handmade presents for Christmas so! I did take the time yesterday evening to finish off the cardigan I was making for Smem, as most of the ones she has are getting a bit small. Still need to prep her for a photo-shoot. Trouble is a brewing. Today my laptop has decided to let me know that it is starting to die. I can turn it on and the mouse works but the keyboard won't work anymore. Its served me well though. I didn't pay too much for it and have it about 2 years. Plus the BF says that I can use his personal laptop (he has 2 cause he has a work one also, and an apple computer!). Just need to take off all the files I want to keep now. I've transferred my patterns and photos of Smem so the important things have been moved. Just need to figure out what else I need to take off it before it finals bites the bullet. Only 6 weeks to Christmas now so I am busy, busy, busy trying to get some presents made. Can't believe the time has gone so quickly. Plus, somebody is not sleeping great these nights so I'm quite tired during the day and not in the mood to get anything done. I have been working away on my quilt for Irish Quilting. I'm happy with it so far, just need to find the time to do it. The deadline isn't til the end of January so I may give it a break until after Christmas. I also finished knitting a present for my BFF so can't show a picture of that either - just in case! What I can show is the first finished ornament for the FAM Etsy ornament swap. I stuffed it a little to pad it out. Hopefully they will be liked - once I have them all complete. Great way to use up all the Christmas stuff I bought last year at the Knitting and Stitching show and never got round to using - being heavily pregnant and all! I joined Etsy FAM (Fabulous Artistic Mothers) this week. One of their events is an ornament swap before Christmas. I had already seen a brilliant tutorial by Laura at Bugs and Fishes for some lovely felt ornaments. 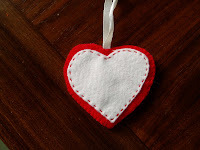 This is my version of her heart ornament. She also has easy to follow tutorials for sequineed baubles and mini christmas puds. And I also tried this bauble-type thing. I think I will go with this one for the ornament swap. 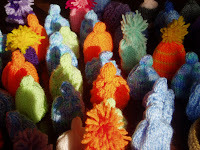 Went to the Knitting and Stitching show yesterday. It was brilliant. So much lovely stuff and some really cool exhibitions too! Only problem is there's nearly too much so its hard to take it all in. Didn't go as crazy as last year (a) the cash machine was out of money and not all of the stalls take credit card, and (b) i can't really afford to be spending loads now, what with not having a job and all. 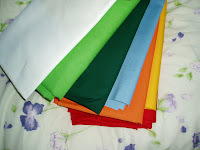 And besides, I still have loads of fabrics left over from last year! The biggest news of the show was the launch of the new quilting magazine from Ireland, Irish Quilting. Sherry seems to be doing really well with it and has had a really good uptake so far. Here is me and all the other ladies. I hate my picture, but sure nothing new there! Found this picture on my camera and realised I had forgotten to mention it. 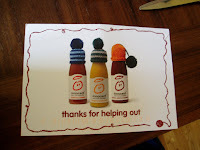 Last Friday week I received this lovely thank you note from Innocent for sending in my knitted hats. A lovely surprise that warmed my heart!